Indiana9 Fossils & Prehistoric Fossils is a family owned and operated business that has it’s headquarters located outside of DeSoto, Missouri. As a child growing up I (Merv) was always fascinated by dinosaurs and wanted to be a Paleontologist when I grew up. Well, God had a different plan for me and I became a professional Paramedic/Firefighter in 1981. As an adult my interest in dinosaurs and fossils was rekindled and I began buying and collecting fossils as a hobby. In 1997 I conceived the idea of starting my own fossil business by selling off duplicates of my own fossils to help support my fossil addiction. At the time I had started buying Mazon Creek Nodules off of eBay and decided to ask one of my favorite sellers (Brian) to allow me to build a website for him to sell his fossils on as well as my duplicates. At the time, he was one of the largest sellers of fossils on eBay. I had recently learned how to build websites using Microsoft FrontPage and was excited to build the fossil site and get down to business! We met in person to discuss the idea and quickly became good friends. The idea was agreed upon and I developed the site and launched it in early 1998. The site contained some of Brian’s fossils and some of my fossils but each kept their own fossils at their location, so when an order was received that contained fossils from each of us we both had to ship separately to the buyer. It all sounded good in theory, but in practice it was not ideal. This continued for almost a year until Brian decided to bow out of the endeavor and left me to develop the website and my fossil business on my own. Now, many people still ask “If you live in Missouri why are you called Indiana9 Fossils”? Well the answer is quite simple. My buddy Brian’s eBay user ID was “Indiana9” because he lived in Indiana. After we started the business I took the eBay user ID of “Indiana9 Fossils” and had started visiting fossils shows, etc.. and people got used to the name. By the time Brian bowed out, the name had been out there long enough that I was “branded” and changing the name was not a good option. So we are Indiana9 Fossils from Missouri! In 2004 I was forced to retire early from the Fire Department due to injuries received during a rescue, which allowed me to go full-time in building my business.. and grow it did! In 2010 I hired my son Christopher to work for me full-time and hired his wife Lisa to work for me part-time. In 2011 Chris & Lisa gave us our NEWEST “Partner” in the business, baby Christopher II. 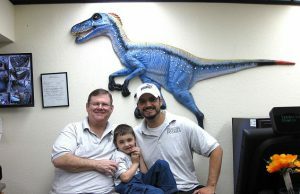 He has grown up “working” in the warehouse and traveling to all of the fossil shows we have done all across the country. Together we have worked to build the business to the point where by April 27th 2015 it was arguably the largest web-based fossil business in the world. Then tragedy struck. An electrical fire totally destroyed the business (mice chewing wires in the walls of the warehouse) causing us to lose our entire inventory. But through the love and support of our family and friends in the fossil world, hard work and dedication and blessings from above we have started to rebuild our business and begin the long journey back to where we are today. In 2016 we realized that the following year Christopher was going to be starting school and that our days of traveling across the country doing the shows was coming to an end. Chris & Lisa suggested that we should open a retail store.. CRAZINESS in my mind!! But.. they were persistant and when asked to expand on their thinking they said we needed to open the store in Branson, Missouri. MORE craziness!! BUT… after we did some research we decided that it wasn’t such a crazy idea after all… Chris is a part-time Real Estate Agent and was tasked with finding us a location to rent or lease in Branson. Well… after seeing those options we explored the option of BUYING a location. Well.. true to His word God provided us with the ideal location that we could put our NEW business and Chris wrote a contract on the property.. then we had to convince the Bank to give us a loan! Long story short.. we put our farm up as collateral and got the loan to buy the property where our NEW STORE is now located! Tucson 2017 was our LAST Show to set up and sell at.. that was a bitter-sweet show. We really enjoyed seeing all our customers and friends and were sad when it was over.. but we had a LOT of work ahead of us so no time to be sad. We all pitched in, including the boy and put together all of our shelving, display cases and cabinets and set to work stocking and organizing the store.. what a chore! We worked until 4:00 am the night before our Grand Opening to make sure the store was ready. At 9:00 am on March 11th, 2017 “Prehistoric Fossils” turned on our OPEN sign and unlocked the doors. It was a COLD day.. Snow and Ice all day, but the anticipation by the public kept a steady stream of people in and out of the store all day in spite of the bad weather! The boy is in school now and still helps us out back at the warehouse, but when he, his mommy and daddy come down to the store he helps us out too.. he loves to greet customers and tell them that “all our fossils, gems, minerals and artifacts are all real”. (He is growing up way too fast). To make things simpler, we will be consolidating both businesses into one entity effective January 1st, 2018. Indiana9 Fossils will change names to Prehistoric Fossils. However the domain name indiana9fossils.com will still get you to the SAME website as always.. nothing else will change.